You may wonder why would anyone want to delete the Office license information? Isn’t this a waste of time? Not so, especially if you are looking for a way to delete the current product key and then enter a new one to fix license errors. Usually, the user has to manually uninstall the Office suite and reinstall it to change the product key. As reinstalling Office suite is a tedious task, we are here to guide you completely remove Microsoft Office XP, Office 2003, Office 2007, and Office 2010, Office 2013 and Office 2016 license information from the registry with the help of a free application. This saves the time that you would spend otherwise on reinstalling the suite. Office Key Remover is a free tool from the maker of Tweak Me! and Office 2010 Trial Extender applications. 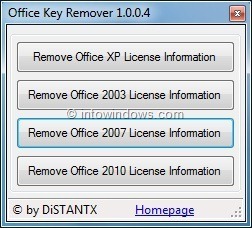 Office Key Remover helps you remove Office XP, Office 2003, Office 2007, Office 2010, Office 2013 and Office 2016 license information from the registry. Download, install and then run the program to see options to remove Office license information. Windows 7, Windows 8/8.1 and Windows 10 (x64) users may need to run the program with admin rights. This tool is compatible with XP, Vista, Windows 7, Windows 8, and Windows 10 operating systems. Please note that the Office Key Remover setup recommends you install Nitro PDF Reader during the product installation. Select “I don’t want to install Nitro PDF Reader” and click next button to install Office Key Remover without installing Nitro PDF Reader. 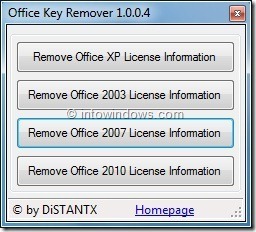 Interested users can download Office Key Remover from developer’s page. You might also like to read our how to recover Office 2010 product key guide. App was never designed for Office 2016 and has no support, no idea why you put that in the article …. There is a vbs script that comes with Office and can do that as well.